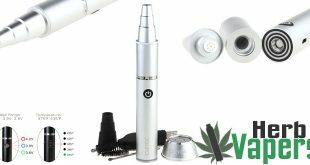 First of all, the Herbstick Eco is basically a smaller and more portable version of the Herbstick Deluxe. This one features a stainless steel heating chamber that truly vaporizes your dry herbs. Additionally the steel mesh vent holes ensure the device doesn’t get too hot to the touch while you’re using it. The mouthpiece is a lot like what you see on an ecig vaporizer, except with a much smaller hole to make it a tighter draw to better simulate what we’re used to. Also the mouthpiece is made of food grade silicone so it doesn’t get too hot on your lips which is a huge plus. Despite it’s small size the Herbstick Eco still manages to pack in a 2200mah battery so you should get a pretty decent run time out of this. In fact the manufacturer claims that you’ll get up to 100 minutes before you need to recharge it. There’s no screen on this but there are 6 different colored lights to indicate your current temperature setting. 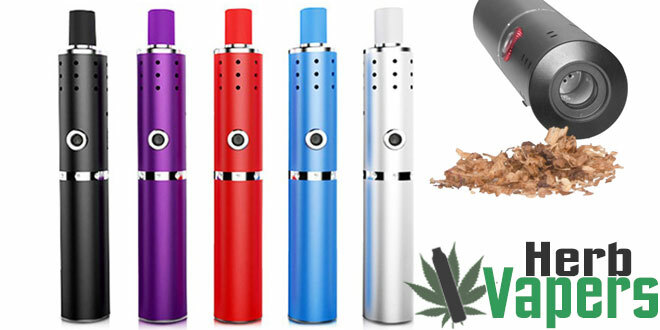 The Herbstick Eco dry herb vaporizer looks great, and at a price that makes it an easy buy for me!